COLD CUT PLATTER. Select your favorite combination of The Honey Baked Ham, Smoked or Roasted Turkey Breast and Roast Beef, and we'll fill in everything else you need to make great sandwiches; Swiss and cheddar cheese, crisp lettuce, sliced tomatoes, specialty mustards and an assortment of fresh breads. Includes our delicious assorted cookies and your selection of two fresh Deli Sides. 10 person Minimum. 10 Person Minimum. 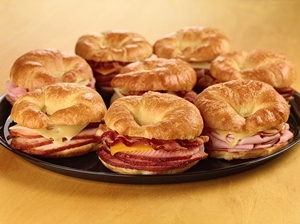 Premium HoneyBaked meats, egg, and cheese tucked into fresh, buttery croissants. Serves 8-12. An abundance of seasonally fresh fruit. Serves 10. 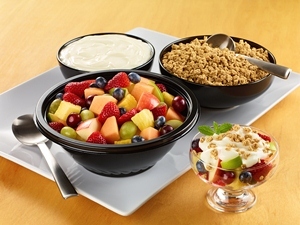 Low-fat vanilla yogurt, toasted granola and fresh fruit. 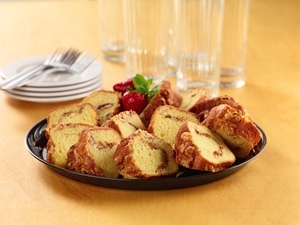 Our Cinnamon Walnut Coffee Cake sliced and arranged on a platter. Serves 12. 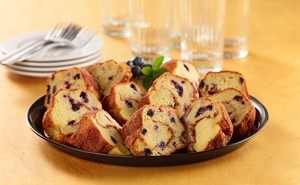 Our blueberry coffee cake sliced and arranged on an platter. Serves 12. Serves 12. 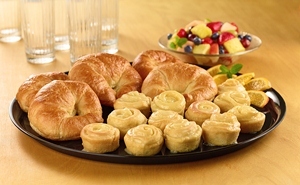 An assortment of breakfast favorites including our Orange rolls and buttery croissants. Honey Baked Ham® and Smoked Turkey Breast, Bacon, ripe tomatoes, cucumbers, Swiss and cheddar cheese arranged atop fresh green leaf lettuce, your choice of dressing on the side. Ham, Turkey, Bacon, Egg, Swiss and Cheddar cheese, tomatoes and fresh greens. Includes an arrangement of fresh vegetables with ranch dressing- great for dipping. Serves 8-12. 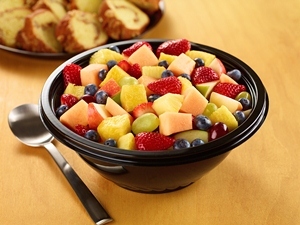 An abundance of seasonally fresh fruit arranged on a serving tray. Serves 8-12. Ham Salad made with signature Honey Baked Ham and hickory honey mustard. Turkey Salad made with HoneyBaked Smoked Turkey Breast, mango chutney, and ground black pepper. Chicken Salad made with shredded, all white meat chicken, fresh red grapes and chopped celery. Fresh-cut broccoli florets mixed with crumbled bacon, golden raisins and chopped red onion in a sweet and tangy dressing.